Posted in: Current Programs, Posts. 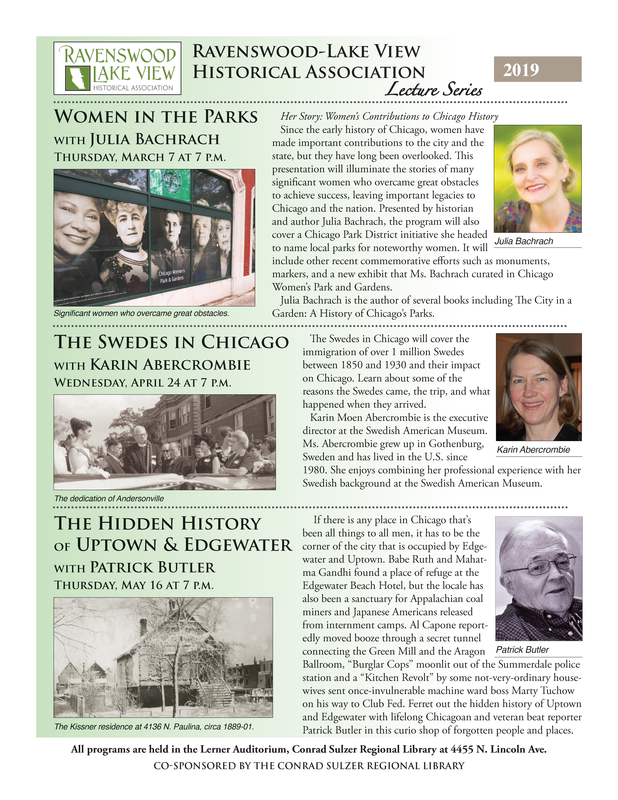 Tagged: Chicago History, Julia Bachrach, Karin Abercrombie, Patrick Butler, The Swedes in Chicago, Women in the Parks. Women in the Parks, with Julia Bachrach: Thursday, March 7 at 7 p.m. The Swedes in Chicago, with Karin Abercrombie: Wednesday, April 24 at 7 p.m. The Hidden History of Uptown & Edgewater, with Patrick Butler: Thursday, May 16 at 7 p.m.
All programs are held in the Lerner Auditorium of Conrad Sulzer Regional Library at 4455 N. Lincoln Ave.